Tada! 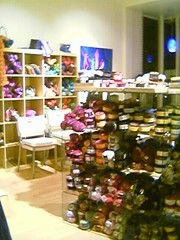 Last night was knit night and we all wandered about the store exclaiming the miracle of how lovely the shop is and stuffed to the gills in only four days. The hard work really paid off! This page is a archive of entries in the sharp points category from November 2005.
sharp points: October 2005 is the previous archive. sharp points: December 2005 is the next archive.